Time goes by so quickly, doesn't it? I just completed my third year at uni and yet it almost feels like I was snapping away on my little compact camera when I first started blogging last weekend. Now on summer holidays, I've been looking for inspiration for new baking ideas and happened to stumble upon this gem by Cupcake Jemma. Now I thought to myself, this beauty should be easy to make. NOPE. The vanilla cake I had baked turned out dense, undercooked and just awful. My first batch of rainbow meringues had too much colour on them and took FOREVER to bake. I only realised my mistake of ignoring a bit of undissolved sugar in the meringue after they came out as hard as a rock when I actually thought that they were still undercooked. *Insert -_- face here*. Oh, and also, do not make these meringues on a humid day, I repeat, not on a humid day! The humidity messes with the sugar in the meringues and makes it sticky on the outside which ruins the appearance and colour on these beauties. After a day of baking disasters, it felt like my 5 years+ of baking experience went out of the window. But as they say, when you fall you gotta pick yourself up am i rite? So this time I opted for my trusty chocolate cake with strawberries and cream filling. I tried out a recipe from the Cake Merchant because creaming butter and sugar, when done correctly, almost always ensures a light and fluffy cake. 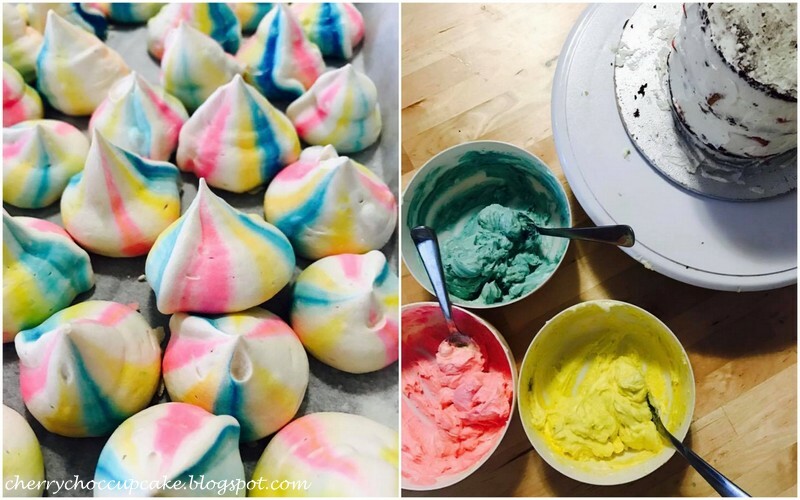 I used a basic recipe for rainbow meringues from Bakers Royale but halved the recipe because I only needed a small amount of "unicorn poop" to top my cake. You can see how these meringue kisses are made from this video. For the outside of the cake, I used a vanilla buttercream frosting which I coloured pink, yellow and blue. I'm usually a sucker for simple cakes but you know, I could get used to making these kind of colourful beasts. Chocolate and cherries are my favourite combination - you've probably seen it already in my Black Forest Cake and even in my blog name, Cherry Choc Cupcake. What I love about this combo is that the fresh cherries offset the sweetness of the chocolate and helps balances the flavours of the cake perfectly. Think of moist, chocolate cake sandwiched in between cream and fresh cherries and topped with luscious milk chocolate ganache. Coming up with the idea of this cake came from my desire to play on the classical Black Forest Cake. Reserving the same flavours, yet introducing a new element to the cake was my main focus. After some random searching on Youtube, I saw a video that displayed the creation of "chocolate bark" and I was instantly sold. What about creating a cake that gave an impression of cutting into a tree log with hidden goodness inside? Obviously it doesn't look like a tree log, but it's close enough with the chocolate bark in place. Putting the cake together was simple as I used my go-to chocolate cake recipe from Sweetapolita. However, instead of baking the cake in 3 separate tins, I baked them in 2 and cut each layer in half after cooling them down. The filling is just whipped cream with pitted, chopped cherries and the chocolate ganache is milk cooking chocolate melted with heated cream. Creating the chocolate bark was super easy - just melt or temper dark cooking chocolate and pipe rows vertically next to each other on baking trays lined with baking paper, leaving space in between each one. Use a spatula knife to smooth out the chocolate and to create the ripples needed to realistically resemble actual bark. Once the chocolate has fully set, assemble the cake with layers of chocolate cake, cream filling and top with chocolate ganache. Then carefully place the chocolate bark around the cake, pressing them slightly against the cake to secure them in place. Top with fresh cherries and refrigerate until ready. These cupcakes are dark. They're seductive. They boast the creaminess and slight tanginess of the mascarpone cream. And to top it off, they've got a luscious, sweet butterscotch sauce to add some luxury to the otherwise dull cupcakes. The idea of pouring caramel sauce over cupcakes is not new - but my main inspiration for it was from Call Me Cupcake. The stark contrast of the cream and caramel sauce against the intense, dark chocolate cakes caught my eye. It's simply stunning to the eye and heavenly for the mouth. For the dark chocolate cupcakes, I used this recipe from Add a Pinch and found that it gave me excellent results. Moist, chocolate-y and moreish, this is my go-to chocolate cupcake recipe. The frosting is super easy and should be used straight away - just whip with an electric mixer about 226 grams of mascarpone cream with 1 cup of thickened cream and 1 teaspoon of vanilla extract. Once it reaches soft peaks, gradually add 1/2 cup of icing sugar/powdered sugar and whip until firm peaks. You'll see it hold its shape when you lift the whisk. Be careful not to over-whip it, or the cream will curdle and turn into butter! For the butterscotch sauce, I used this recipe from Just a Taste. I definitely felt that I could've taken the butterscotch sauce a bit further for a more intense caramel flavour and colour but was pleasantly surprised at how well the sauce complemented the cream in its original state. Once the cupcakes are baked and cooled, pipe the cream and pour over the butterscotch sauce. For extra decadence, add a pinch of salt. Voila! This post is quite different from usual, but every baking blog needs a little savoury touch once in a while right? I've been eating quite a lot of sushi lately, so when I recently discovered my love for salmon and avocado sushi, I decided to take up the challenge of making my own sushi. 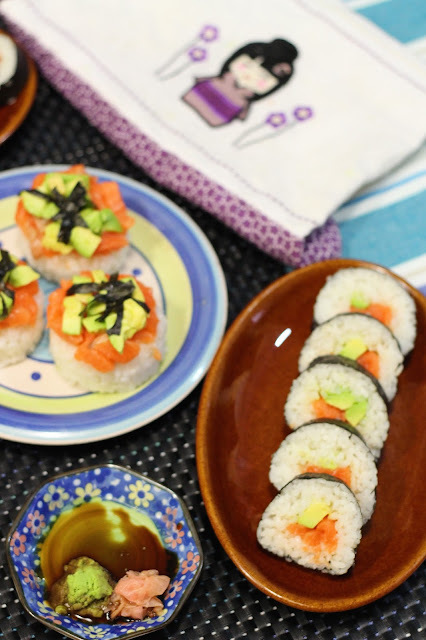 There's just something with the creaminess of the avocado that perfectly matches the fresh taste and slight fattiness of raw salmon. When making sushi, it's really important to use the freshest ingredients due to the minimal cooking processes required. I used organic sashimi-grade salmon fillets (skin-on), and just fried the skin to create a crispy snack. This is my second post in a row featuring strawberries, which might or might not be due to the abundance of these berries at the moment. I just love how they freshen up a baked good and add a slightly tart flavour to take away some of the sweetness. You might notice that I'm always trying to come up with a way to reduce the amount of sweetness in a dessert or baked treat - because, in reality, nobody likes sickly sweet food. In my early baking days, all of my sweets were either full of butter or sugar. Like this multi-coloured rainbow cake I made a few years ago. On a side note, it's my 3rd blogiversary! It's hard to believe that three years ago, I was once a 15 year old girl with a burning passion to bake and whip up desserts. I remember being successful at my first attempt at making macarons with my very first blog post back in 2012 and I've always been baking since. Had cherries been in season right now, I would've made some cherry chocolate cupcakes to celebrate. But there's always a next time right? So, on to these cupcakes! I decided to use this recipe from the Cupcake Project for the vanilla cupcakes. Although I did get mostly vanilla-y, fluffy and moist cupcakes, I had a problem with some of the cupcakes shrinking from their cases. I dismissed the thought that it was the recipe and opted to blame the cupcake liners instead. Putting that aside, I made the cupcakes according to the recipe and mixed in chopped white chocolate and fresh strawberries to the finished batter. Viola! Mixing in white chocolate and strawberries makes ordinary vanilla cupcakes so much more special. For the frosting, I used my beloved swiss meringue buttercream for its silky texture and slight sweetness. And since baking is loads more fun with friends, I let my two best buddies decorate the cupcakes with swirls of icing and strawberry roses. 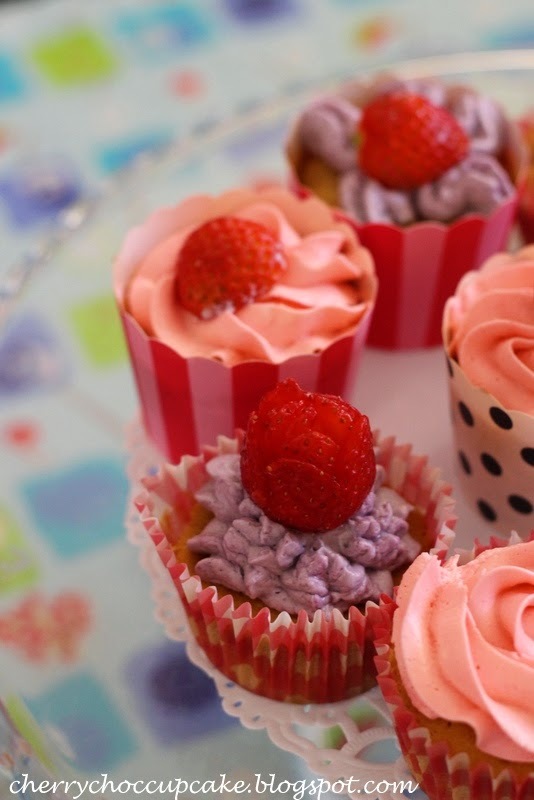 Cupcakes to me, are truly the epitome of elegance and beauty. They are also small enough to not be guilty about the amount of sugar or fat eaten. With that being said, how can anyone reject a cupcake anyway? And of course I would like to end this post with a smile from K and a peace sign. Peace out! Chocolate and strawberries are a modern, yet classical combination. 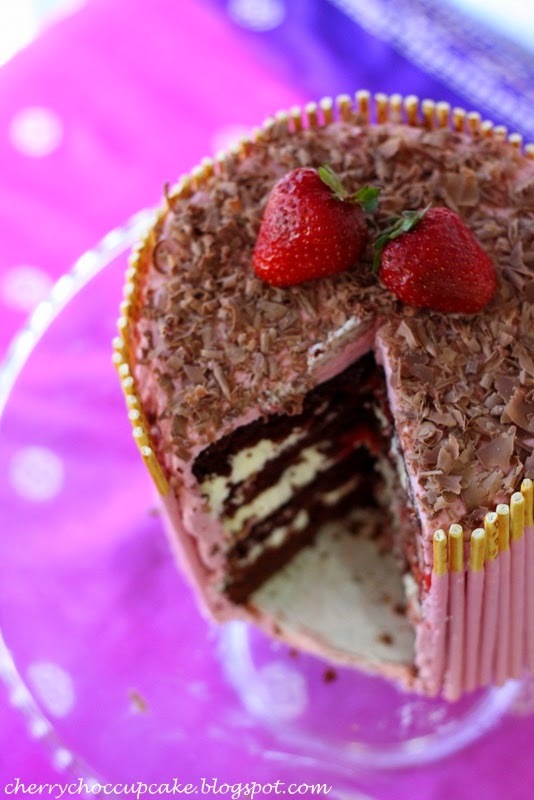 Especially in a cake - where the tartness of the strawberries helps balance out the richness of the chocolate, and the sweetness of the buttercream. It might sound cliché, but it is, I believe, a match made on Earth for those romantics out there (hahaha....nope?). This cake captures the essence of the chocolate and strawberries - an idea presented to me by my adorable best friend and university buddy K, who I am proud to dedicate this cake and post to. After going through some of the toughest times in my life, K was there to listen, give advice and ultimately helped me get through it. Also, props to K for helping me assemble and decorate the cake!! 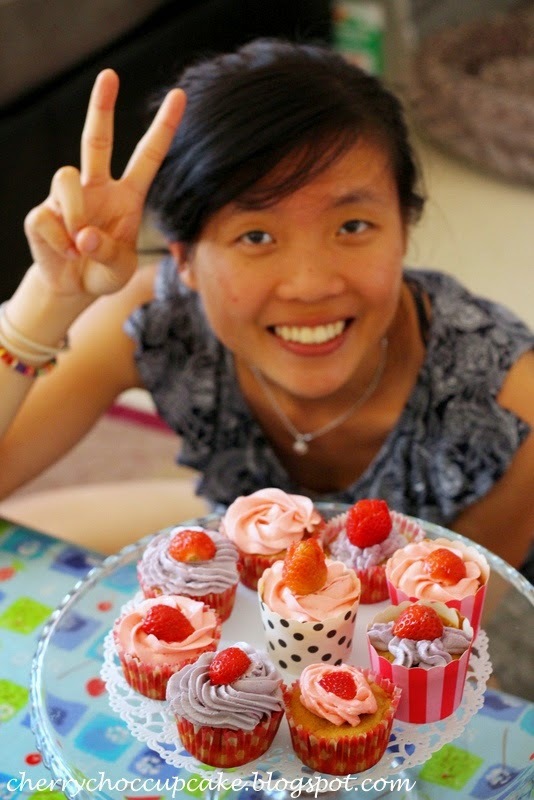 The strawberry pocky decoration was inspired by two of my favourite bloggers - Raspberri Cupcakes and Sprinkle Bakes. After seeing the cake on the blogs for the first time, I immediately added it to my long baking list that always seems to end up at the bottom of my cupboard. Going through the list was like uncovering buried treasure because it contained some recipes I even forgot that I added a few years back. Since chocolate and strawberries were the theme for this cake, an idea popped in my head to have chocolate cake layers, filled with fresh cream and strawberries, covered in strawberry swiss meringue buttercream and encased in strawberry pocky sticks. 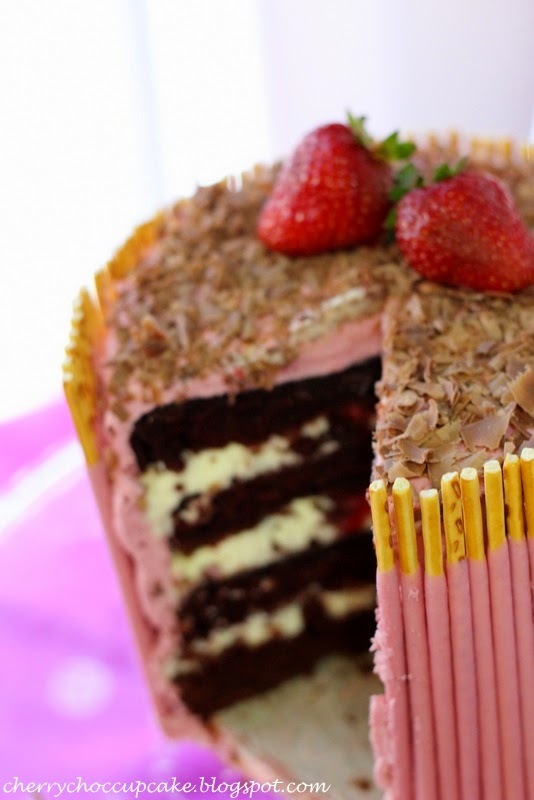 What I love about this cake is that the strawberry pocky - I used 4 boxes - helps to cover the messy frosting underneath and removes the hours (okay - maybe minutes if you're pro) to smooth out the frosting. I've always wanted to bake danish pastries. It's been on my to-bake list ever since, well, I embarked on my baking adventure when I first started this blog. It also turns out that my mother, who has been eating danish pastries as a child, had cravings for these and personally requested them. Which is completely fine by me, as I have no memory of making them let alone eating them before. But I can say it was the perfect opportunity to try them out since I have been procrastinating due to the knowledge that danish pastries involve essentially repeatedly rolling, folding, turning and chilling for the laminating of the butter process which can take AGES for me. Then there's the proving of the shaped dough for about an hour before being baked in the oven until puffed and golden. For some reason I managed to over-bake the pastries and turned the small pieces of dough into crunchy butter biscuits instead of fluffy pastry. But rest assured, I was able to salvage the larger pastries and devour them with pleasure. I actually made a test batch of these pastries for tasting and thought they were plain and flavourless. Maybe because it was the cheap, low quality unsalted butter I used. Or maybe because it was the lack of salted butter. Nonetheless, I folded another layer of salted butter into the dough and thankfully, its flavour improved vastly. However my limited pastry skills were demonstrated in the lack of precision and some pastries turned out a bit messier than intended. Also blame the fact that the pastry kept melting for some explicable reason even the weather was not hot. Despite these mishaps, they came out delicious straight from the oven, especially when they're warm. I whipped up a cream cheese filling for the pastries and topped them with some cherries. If you've read my past posts, cherries have become a common presence recently, and this is just another good way to use them up. Funnily I initially made a pastry cream, or in fancy French words, "creme patissiere" but I added to much milk because I thought it was too thick. Oops. Anyhow, go to this great website for a guide in shaping danish pastries and the recipe for the cream cheese filling just because I'm too lazy to copy everything on here. However, the recipe for the danish pastries and optional pastry cream is posted below. Enjoy! Adapted from the cookbook, Essential Baking. For the pastry cream filling (optional) or use the cream cheese filling, recipe here. Stir the yeast, milk and sugar in a small bowl until dissolved. Leave in a warm place for 10 minutes until frothy and slightly increased in volume. Sift the flour into a large bowl and add salt and extra sugar. Make a well into the center and add the yeast, egg and vanilla. Mix until it forms a firm dough or alternatively use the dough hook attachment of an electric mixer to combine the ingredients together. Turn out onto a lightly floured surface and knead for 10 minutes to form a smooth, elastic dough. Place in a lightly greased bowl, cover and set aside in a warm place for 1 hour, until doubled in size. Meanwhile, roll and shape the two butters together between two sheets of cling wrap into a 15 x 20 cm rectangle and refrigerate. Knock back the dough in one punch and knead for 1 minute. Roll the dough out to a rectangle of 25 x 30 cm. Put the butter in the center of the dough and fold up the bottom and top of the dough over the butter to join in the center like a letter. Give the dough a quarter-turn clockwise, roll out to a 20 x 45 cm rectangle. Fold over the top third of pastry, then bottom third and give another quarter-turn clockwise. Cover and refrigerate for 30 minutes. Repeat the rolling, folding, turning and chilling four more times. Wrap in plastic wrap and chill for at least another 2 hours. For the pastry cream, put the sugar, egg yolks and flours in a saucepan and whisk to combine. Pour the hot milk over the top and whisk until smooth. Bring to the boil over medium heat, stirring constantly, until the mixture boils and thickens. Cover and refrigerate to cool. Preheat the oven to 200 degrees C (400 degrees F) and line two baking trays with baking paper. On a lightly floured surface, roll the dough into a large rectangle 3 mm thick. Cut 4 inch squares and shape into desired shapes, demonstrated here and place on prepared baking trays. Cover the shaped pastries and leave in a warm place to prove from 30 minutes to an hour until puffed and doubled in size. Fill each Danish pastry with about 1 tablespoon filling and top with jam, fruit or berries. Brush with egg wash (1 egg and 1 tablespoon water). Bake in the oven for 15-20 minutes until golden. Cool on wire racks and serve warm.